Rob Huff, dominated the first of the FIA World Touring Car Championship races in Macau on Sunday. 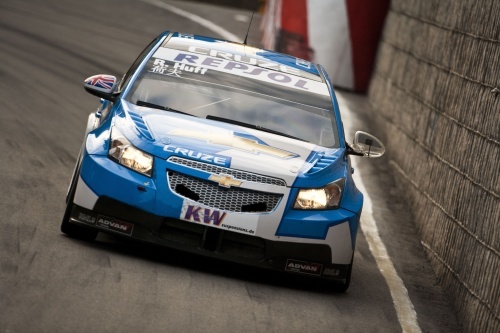 Rob won Race 1 in his Chevrolet Cruze to seal an impressive fifth place in the championship, with Gabriele Tarquini claiming the 2009 FIA WTCC crown. Rob led away cleanly at the start in his Chevrolet Cruz, as fellow front-row starter Andy Priaulx hit trouble – falling back into the pack and then clouting the wall at the exit of Turn One as he tried to fight off his rivals. Andy’s problems allowed Tiago Monteiro to move up to second spot early on, with Gabriele Tarquini charging through the order to be up to third by the time the cars braked into Lisboa Bend. From there, Rob managed to open up a cushion over Monteiro until on lap eight the Portuguese SEAT driver slowed down – handing second place to Tarquini.